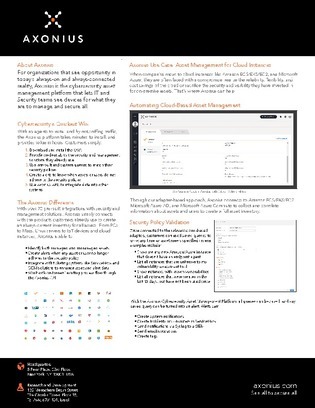 When companies move to cloud instances like Amazon ECS/EKS/EC2, and Microsoft Azure, they are often faced with a compromise. They realize the reliability, flexibility, and cost savings of the cloud often sacrifice the security and visibility they have invested in for on-premise assets. In this infographic, learn how Axonius can help.